For this task your code should take two sorted arrays of integers X and Y as input. 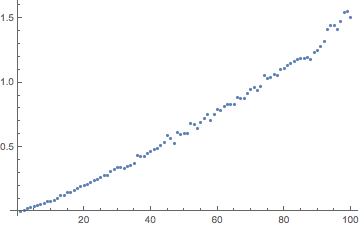 It should compute the sum of the absolute distances between each integer in X and its closest number in Y. The distance is 2 + 1 + 2. The distance is 1 + 2 + 3. Your code can take input in any way that is convenient. On our first case from here we bind d to e:_ with e:_<-d. This ensures that d is non-empty and sets it's first element to e.
Then if the second element of \$Y\$ (e) is closer than the first (c) to the first element of \$X\$ (a), we return x#d removing the first element of \$Y\$ and calling again with the same \$X\$. Which, removes the first item of \$X\$ and adds the absolute difference of it from the first element of \$X\$ to the remaining result. Lastly if we don't match the pattern we return \$0\$. Not matching the pattern means that \$X\$ must be empty because \$Y\$ cannot be empty. This algorithm has order notation \$O(|X|+|Y|)\$. Saved 4 bytes by moving to program versus function. Meeting the time-complexity constraint is possible because both lists are sorted. Note that each time around the loop, either i is incremented or j is incremented. Thus the loop is executed at most len(X)+len(Y) times. This takes input as two integer arrays and their lengths (since C has no way to get their length otherwise). This can be shown to run in O(a+b) because either a or b is decremented on each iteration of the loop, which terminates when a reaches 0 (and b cannot be decremented below 0). Instead of indexing into the arrays, incrementing the pointers and dereferencing directly saves enough bytes for it to be worth it (*x vs x[a] and y vs y[b+1]). The --b&& condition checks for b>1 in a roundabout way - if b is 1, it will evaluate to zero. Since this modifies b, we don't need to change it in the first branch of the ternary (which advances y), but we do need to change it back in the second (which advances x). It run in O(|X|+|Y|): Every recursion run in O(1), and it recursive |X|+|Y| times. Not the answer you're looking for? Browse other questions tagged code-golf restricted-complexity or ask your own question.